Karen's Poetry Spot: The Vision by Joseph Smith Jr. The Vision by Joseph Smith Jr.
To read the full text of this poetical rendering of D&C section 76, click here. Today in Church, we had a lesson from the Joseph Smith Manual titled, "Beyond the Veil: Life in the Eternities." We talked mostly about the three degrees of glory, and who will go to which one (If you are reading this and you're not familiar with the teachings of the Church of Jesus Christ of Latter Day Saints, you may want to read the Encyclopedia of Mormonism article on Degrees of Glory to get an overview of the doctrine we were discussing). I mentioned a little sheepishly to someone sitting near me that it would have been easier to answer the questions about specific attributes that qualify you for each kingdom if I'd brought my scriptures with me (I carry around 22 pounds of baby, and 25 pounds of baby stuff -- At the moment, I'm limiting my books to a pocket sized Book of Mormon and New Testament). She said that she wouldn't know where to look, so I opened her scriptures to D&C Section 76 and showed her that the summary showed which verses talked about each of the Degrees of Glory. After that, she partly listened to the lesson, and partly read that section of the Doctrine and Covenants. At one point during the lesson, she asked me to repeat what had just been said -- that the only way to reach the highest degree of glory in the Celestial Kingdom was to make and keep the covenants of Eternal Marriage (see D&C 131:1-4). At the end of the lesson, she turned to me and said something along the lines of, "I'm sure I've read this before, but I really don't remember it. I'd kind of thought about the subject, but I don't remember seeing it spelled out so distinctly. There's not really a lot of room for interpretation in this. So does this mean that if you don't join the church and go to the temple in this life that there's no chance for you? Someone in my extended family isn't a member, and it tears me up to think that not only he, but his faithful Mormon wife won't make it." I told her that if this life was all the chance there was, then there would be no point in doing temple work for the dead. I also said that there are many reasons that someone might not join the church, and that not all of them were that they didn't believe in Jesus Christ and accept him as their personal savior. Essentially, I said that there is a chance for this family member. At that point, her child arrived with gum all over his hands, and she had to go take care of him, so I didn't get to finish explaining the other side of the issue, so I thought I'd post my understanding of it here, and ask for comments so that when I see her later, I can be sure to have my facts straight. This life is the time to prepare to meet God. Earth Life is a kind of test to see whether we can have faith and keep His commandments. The same spirit that possesses our bodies when we die will do so in the hereafter. So if a person is unwilling to keep the commandments when alive, they'll probably be unwilling to do so after they're dead (This is what Alma talks about in his sermon on restoration. See Alma 34:32-35). Heaven is a place of Eternal Progression. In the highest degree of the Celestial Kingdom, we won't be sitting around on clouds and playing harps, we'll be doing things -- learning, teaching creating, having families, and leading another generation of spirit children to exaltation (see D&C 132:20). I'm not really sure of the details, but it'll be work. God said, "this is my work and my glory—to bring to pass the immortality and eternal life of man." (SeeMoses 1:39) This brings me back to the concept of restoration -- if you weren't willing to work for your own salvation during earth life, then why would you be willing to work for others' in the eternities? Remember the parable of the talents (see Matt 25:14-30) -- the guy with two talents didn't LOSE the Lord's money. He wasn't evil, spending it on his own vices or gambling it away. He just didn't do anything with it to make it more than it was before. People who don't try to progress toward salvation (the ones going to the Terrestrial Kingdom. see D&C 76:79) will have what they were given taken away (they won't have their families in the eternities. see D&C 132:15-20). Now, I don't really know this family member, and even if I did, I am in no position to judge his reasons for not joining the Church. Is he lazy, and just wants to have a worldly lifestyle without the demands of all that following the commandments business? Or is he a good person, who's trying to live the best way he knows how, and just doesn't understand the importance of baptism and other covenants? Was he taught something as a child that makes it hard for him to accept Mormonism or abandon the faith of his fathers? Did someone offend him so badly that he won't give the message a chance? I don't know. Even if I knew all the details of his life, I wouldn't presume to know the deepest intents of his heart. That's what the Lord means when He tells us not to judge others (see Matt 7:1-2). I can't tell my friend or anyone else which kingdom they or anyone else will be going to. I do know that the Lord is infinitely merciful, and that each of his children will be given a fair chance, whether in this life or the next, to accept the gospel, repent of their sins, and receive the blessings of the atonement (see D&C 138). I believe that we will have a say in our Last Judgement and assignment to kingdoms (see the last section of today's lesson from the Joseph Smith Manual). I believe that we will choose to be with people who made similar choices -- that that's the degree of glory we'll be comfortable with. I believe that where ever we go, it'll be better than we could possibly have hoped or imagined (see D&C 76:89-90). So is there hope for this person? Yes. Should his family rest easy on that hope, and not continue to invite him to partake of the gospel message while he's alive? No. I believe that there will be consequences for those who procrastinate the day of their repentance (see Alma 34:33-35). It will be harder for them to make the necessary changes after they're dead. How? In what way? What consequences? I don't know. But I know that as I said at the beginning, this life is the time to prepare to meet God. One more thing: There's a lot we don't understand about heaven and what will be going on there after we die. One could argue that if even the Telestial kingdom is going to be infintely better than Earth life, then "Why even bother trying for anything better? That's good enough for me." To this, I say the same thing that I say to those people who don't believe there's an afterlife at all. Keeping the commandments and living the gospel as outlined in the scriptures and teachings of the prophets will make you happier here and now. No matter what happens after we die, being kind to other people, forgiving others, and valuing our families are things that are clinically proven to bring happiness and peace. Anyway, that's what I believe. What do you believe? Are there relevant scriptures that I haven't cited? Even if you don't regularly comment, I'd love to have your thoughts on this one. Thank you for writing this out. I really appreciate your thoughtfulness. All of it makes a lot more sense. It helped too to talk to my husband and my mother-in-law. Anyway, you are an awesome friend and a very good writer! I really enjoyed this post. On the way home from Grandpa's funeral I prayed to be able to share the gospel with someone and ended up sitting next to a young man who had just served a "mission" for his church down in Australia. Since death was on my mind we talked a bit about the after life. He didn't have any clear cut views about what happens when we die and seemed to think I was a crazy person when I explained a little bit about my views of death. I do want to throw out another question. A very dear friend of mine is a wonderful Catholic. When I discussed the three degrees of glory with her she was almost a bit offended that I would say that her family wouldn't be a family in the next life if they hadn't accepted certain ordinances and covenants. If she and her family members all end up in the same kingdom of glory how are they not a family? Even if they weren't officially tied together, wouldn't they still be able to call each other mother, daughter, father? They might not be able to eternally increase, but how are they not still in the same roles they were in on earth? Well said, Karen! I could tell that you put a tremendous amount of effort into making this post. I’d like to comment on one small part. Moses 1:39 has long been a favorite of mine. Yes, there is much that each of can do and needs to do, but when it comes right down to it, Heavenly Father tells us that it is HIS Work and HIS Glory to bring to pass our immortality and eternal life. It’s not our work--it’s HIS! He wants each of us to succeed, and is in there pulling for each of us, if we will only do what he says! We’re missing the boat when we don’t follow what he tells us to do. Many people think that following commandments is too restrictive, but doing so actually gives us more freedom here and now. Barbie gave me a good example once when she said that if we keep our bodies clean & pure, for instance, we will be free from the heartache, misery and expense we could have from being infected with STD’s. Following Heavenly Father’s commandments brings us safety and joy in this life, and unlimited possibilities in the life to come. I think that once again, the problem comes from not knowing what we'll actually be doing in the afterlife. What is the point of a family? What binds us together? What does a family that is Sealed together look like in the afterlife? Will my kids be living with me at my house? or will I be living with my brothers and sister at Mom and Dad's house (which is what I imagined in Primary)? And if so, then what about their spouses and children, and won't Mom and Dad be living with their parents and siblings? None of these scenarios really makes sense. If we don't know enough to define what a forever family looks like, then how do we differentiate it from one that's not sealed? I personally think (and this is KAREN'S OPINION rather than anything I have a source for) that celestially sealed husbands and wives will go off and start new worlds and teach new spirit children what they need to learn to grow up into gods. That the sealing of parents to children is mostly symbolic -- just as animal sacrifice was symbolic of Christ's atonement -- this is symbolic of the way parents and grandparents care for their children and children care for their parents and grandparents, and how all of those relationships teach us the Christlike unconditional love we'll need to be good Heavenly Parents. I think that people will be able to see and associate with their family and friends in the afterlife in whatever kingdom they end up in, but that without the purpose of creating new eternal families of spirit children, a mother or spouse or sibling will be no more important an associate than a good friend is. Also, remember that the people who end up in the lower kingdoms are people who don't want the responsibility that comes with being in a higher kingdom. Maybe these same people won't want to take the time and energy it takes to keep relationships going when there is no common goal to work towards (like raising children in a troubled world). 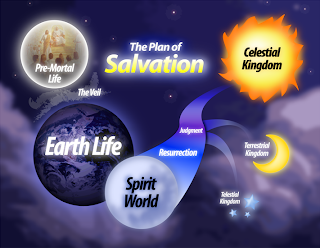 I think we will be very surprised when we get to the other side, both by who, and how many people really are saved and make it to the celestial kingdom, and by what heaven is really going to be like. Thanks for all the photos and news! It's fun to see Eliza be. We couldn't get any of the video to work though:( is it because I am on a mac?